As a professional athlete most known for building a multi-sport legacy, Brian Jordan is clearly a man of many talents. Sports enthusiasts have long been aware of his athletic skills, as he has been an All-Star player with the Atlanta Braves and an All-Pro selection with the Atlanta Falcons. For almost 20 years, Jordan has helped make sports history, as a leader on both the baseball and football fields. Being a two-sport professional athlete is an uncommon accurrence in professional sports, the Baltimore native has contributed more to Atlanta than just home runs and bone-jarring tackles. Jordan is an Emmy award-winning sports analyst for FOX Sports South and a recurring broadcast personality for Comcast Sports South and ESPN. As a lead analyst for both the Atlanta and Gwinnett Braves, he is in the homes of millions of sports lovers every week. 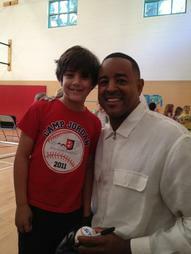 In 1998, he founded the Brian Jordan Foundation, which helps children strive to reach their full potential. The mission of his non-profit organization is to provide useful information, resources, and tools to help and support young people and their families. The foundation’s educational program awards scholarships to deserving young people. Through a three-core program model, which includes literacy, health & fitness and scholarships, the Brian Jordan Foundation is successful in building stronger young people and helping them achieve their full potential. Since childhood, Jordan realized that success meant giving back to his community. His mother, a schoolteacher, and his father, a steelworker embedded these moral values in him. As he walks his path of success, he continues to create vehicles and opportunities to help others to succeed. Now, a highly sought after speaker, analyst and author, Jordan, most recently, began displaying his considerable talent as a writer. Brian is a featured guest on FGTV's Writers In Focus. Host James Taylor finds out Brian's inspirations and influences as a writer of children's books. Watch the interview below. His best-selling children’s book entitled, "I Told You I Can Play," is a brilliant chronicle of how he followed his heart to show young people that they can do anything, if they put their minds to it. 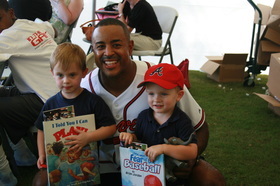 In 2010, Jordan also released his second children’s book entitled "Overcoming the Fear of the Baseball." This, must read, details a childhood experience when Jordan was hit in the face with a fastball. Instead of calling it quits, he was forced to face his fear and returned to the baseball field where he went on to play 15 years of Major League Baseball. Jordan's most recent children's book entitled "Time-Out For Bullies" discusses how his mother taught him first-hand what bullying was and how it negatively impacts children. He then reveals how he used his athletic ability to help those dealing with bullies in his school. Jordan is affiliated with an impressive list of prestigious organizations. He serves on the Morehouse School of Medicine Board. Most importantly, he has privately funded a wellness center for Grady Hospital employees and full college scholarships and mentorships for several students and young athletes. Jordan is also an ambassador and public advocate for the YMCA, The American Diabetes Association and Boy Scouts of America. He has been honored as the Boy Scouts Peach of an Athlete Role Model award and inducted into the Virginia Hall of Fame as well as the University of Richmond Hall of Fame.